(U//LES) In January 2009, the ATF Office of Strategic Intelligence and Information (OSII) disseminated the Outlaw Motorcycle Gangs (OMGs) and the Military report to numerous local, State, Federal, and military law enforcement agencies, as well as several foreign law enforcement agencies experiencing similar problems. 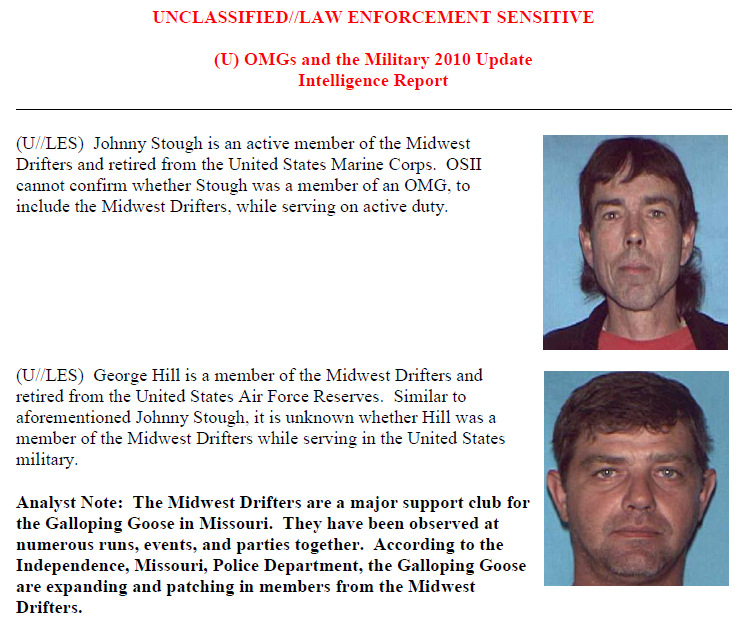 Enclosed in the report were maps and charts depicting active duty, prior service, and/or retired military personnel who were current members of a documented 1% OMG (these are OMGs that are accepted by law enforcement to be specifically engaged in criminal activity). ATF OSII also reported on current 1% OMG members who were employed on military compounds, bases, instillations, and Federal buildings in the United States and abroad. Analyst Note: It was later discovered that several of the OMG members listed in the previous report held a security clearance, which will be discussed in the report. 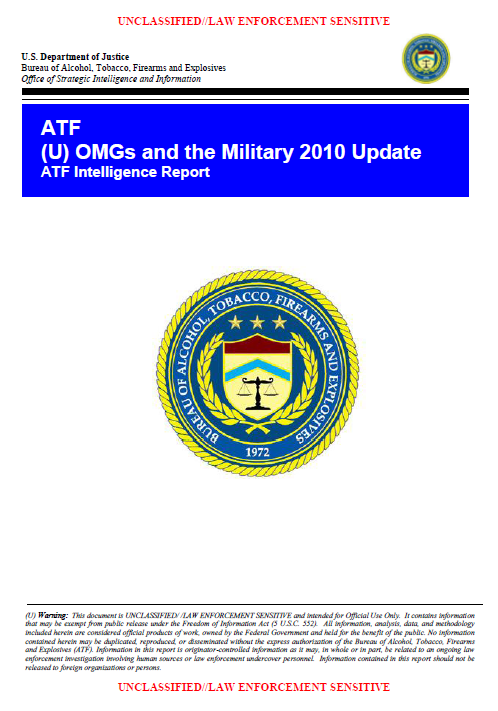 (U//LES) Within 3 weeks of ATF OSII disseminating the OMGs and the Military report, ATF received approximately 36 inquiries from numerous law enforcement agencies with updated intelligence. For the next year, ATF analysts coordinated with more than 45 law enforcement agencies to consolidate updated information. These included State and local law enforcement near prominent military installations, the various criminal investigative commands within the Department of Defense, and even some foreign law enforcement agencies. The updated and new information collected is now the basis for this report. (U//LES) Similar to the previous report, current law enforcement reporting continues to document active duty, National Guard, and Reserve military members (encompassing all of the armed services) in several 1% OMGs and their support clubs/organizations. There does not appear to be any single military policy regarding membership in OMGs; policies seem to differ among the branches of service, among different commands, and from installation to installation. (U//LES) Numerous OMG members have previous military service; in fact, several prominent OMGs were founded by Vietnam veterans, and their current leadership still includes numerous veterans and personnel with military training. Additionally, several United States Government contractors with security clearances were identified as previous military members who are current OMG members. (U//LES) As of January 2010, the Hells Angels have not voted on the amendment to their By-laws, which prohibits an individual from becoming a Hells Angels member or prospect while he is active-duty military. In contrast, the Outlaws, Pagans, and Mongols, adversaries of the Hells Angels, are actively recruiting from the military for new members. (U//LES) Many OMG members with prior military service or who currently serve in the Armed Forces display some type of military insignia (pins, patches, placards, etc.) on their motorcycles and/or colors. (U//LES) A foreign national airman detailed to a United States Air Force base had been an OMG prospect in his home nation, and then became a fully-patched member while in service in the United States. (U//LES) Distinct from the last report, OSII contacted law enforcement agencies in Europe, Australia, and Canada inquiring if they had similar occurrences of the same phenomenon as the United States. Even though the problem was not characterized as being as prominent as it is in the United States, countries such as England and the Netherlands reported having active-duty military personnel with membership in OMGs and their support clubs. Additionally, several British OMG members are documented as having served in Special Forces units while in the military. 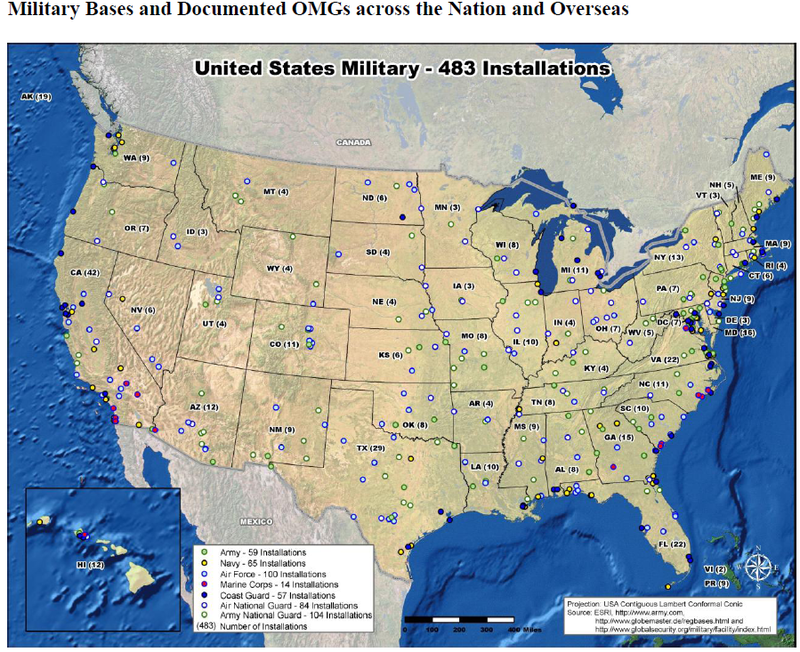 (U//LES) Analysis revealed that there were a vast amount of OMGs and support clubs operating around United States military bases, both domestic and abroad, that were comprised of members of the United States military. Many of these members were active duty; however, several of the OMG members were National Guard or Reserves, assigned or recently deployed back to the base from a tour in Iraq or Afghanistan. It was also determined that several contractors assigned to a particular military base, compound, or Federal installation where members of a documented OMG or support club. In some instances, military members were assigned to the same branch of service on the same base; however, they were members of adversarial OMGs. Additionally, OSII realized that within several of the support clubs for the Vagos, Hells Angels, Bandidos, and Pagans, membership was comprised of more than 50 percent active-duty military, National Guard, or Reserve members. On more than one occasion, it was discovered that an OMG support club was comprised of National Guard and/or Reserve soldiers who were also full-time law enforcement officers when they were not wearing a United States military uniform.